Calf muscle pain can be due to injury, underlying medical condition or a problem in the nerves or arteries in the lower leg. 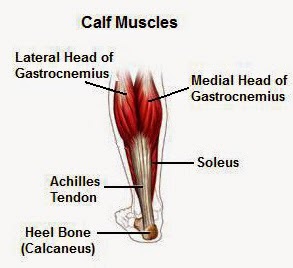 The calf muscles are located in the posterior side of the lower leg, and comprise two muscles. The protuberant part is made up of the gastrocnemius muscle.The calf muscles are the ones that enable basic movements like walking, running, and jumping. No wonder then, that they undergo considerable strain, especially among people who are active on their feet. Calf muscle strain is also a common grouse among sportsmen. The calves are among the muscles most likely to cramp. This will often occur at night when you are trying to sleep, or as a result of exertion – often if you are trying to go up on your tip toes or if you are tensing them. If you have this problem then the best solution is to get up and move around and to try manipulating and flexing your legs. At the same time in order to prevent the cramping from occurring again in future make sure that you get enough sodium and potassium in your diet. Likewise if you workout or engage in sports, then make sure to set aside an adequate cool-down period and to spend the necessary time letting your muscles recover. The contractions that cause cramps are often caused by muscle fatigue. Of course it is also possible that you have simply injured your calf. This can occur for instance if you have bruised it via trauma or if you have pulled a muscle. Pulling a muscle in the calf is a relatively common ailment and is caused by over stretching the calf suddenly when it is not properly warmed up with a sudden large movement. This can then cause the muscle fibers in the calf to rip as they become overly stretched and this in turn can cause swelling, pain, lack of muscle strength and mobility and bruising. When this occurs it is important to make sure that you rest the injured leg while addressing the swelling by keeping it above heart level, using compression such as with a compression sock and applying a cool pack. This is the tendon that attaches the calf muscle to the heel, and so should this rupture the pain will be located just below the calf muscle. This rupture is serious and should be treated by physiotherapy in order to improve balance and strength and thereby prevent future issues. A rare but possible cause of calf pain is blood clots. These form when the blood is unable to flow freely around the veins deep in the calf because it has been somehow blocked and this can of course cause result in severe discomfort. This pain becomes more likely when recovering from recent injury or complications and when the individual struggles with high blood pressure or cholesterol. The plantaris muscle is a very thin muscle in the calf and what makes it particularly amazing is that not everyone even has this muscle (10-20% of the population do not). This muscle runs across the gastrocnemius muscle, but is just a fraction of the size meaning that it can quite easily rupture. This results in a very sudden snapping pain in the back of the calf. While very painful, this muscle has no benefit to your movement or power in your leg and is therefore not usually treated. When you exercise in any way then you will cause tiny microtears in the muscle. These tiny tears are what cause your muscle to grow larger – as when the body goes to repair them it will build them back bigger and stronger. These tears are a good thing then and this pain is what is known in bodybuilding circles as 'the burn'. It should subside on its own after a couple of days of rest and it's your job to get this rest while fueling your body with protein – the substance that the muscle will be reconstructed out of. Meanwhile the calf is also a common site for deep vein thrombosis or DVT. This occurs when the body is unable to pump the blood around the body effectively and so it pools in the calves creating calf pain along with more visible veins in the area. This can be addressed by spending less time on your feet (it is common for those in jobs that require a lot of standing), by losing weight, by strengthening the heart and by improving blood pressure. It is necessary to rest your legs and keep them elevated for a day or two. This can be continued until the pain and tenderness in the muscles disappears. During this time, avoid any strenuous exercise or exertion of the leg muscles. Apply an ice pack to the affected area 3 to 4 times a day, for a duration of 10 minutes every time. Consult your doctor about using an elastic compression bandage, which may bring relief. If your leg is swollen, you may keep it at an elevated position in order to reduce the swelling. If the swelling persists and/or you still have tenderness in calf along with pain, then your doctor may prescribe pain relief medication. Light stretching exercises can be performed only after your doctor gives you the go-ahead. Some people use compression techniques to relieve a calf muscle ache. To try this treatment, simply wrap your calf muscle with elastic bandage materials. Use the same type of wrap that you would use on a sprained ankle. This remedy is believed to work because it reduces movement of the sore muscles, and it reduces muscle tendon swelling. You can also try elevating your sore calf, raising it above your heart level while sitting or sleeping. Many doctors also recommend taking an over-the-counter pain-relieving medication, such as naproxen or ibuprofen. These types of medications work to relieve a calf muscle ache as well as to reduce inflammation in the muscles. Be sure to check with your doctor to make sure that these types of medications will not negatively counteract with any other medications you’re currently taking. After your leg begins to recover, you also might want to incorporate deep stretching exercises and calf muscle-building practices into your normal regimen in order to prevent future injuries. In case of an intense trauma to the calf muscles, your leg may be put in a cast to restrict mobility and speed up the healing. In some instances, surgery may be required.